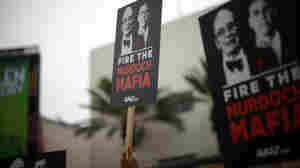 Protesters demonstrate outside the News Corp. annual shareholder meeting at Fox Studios in Los Angeles on Friday. October 21, 2011  The company held its first shareholder's meeting since the U.K. phone-hacking scandal erupted. Outside, protesters assembled to condemn News Corp.'s leadership. Inside, investors protested, too. 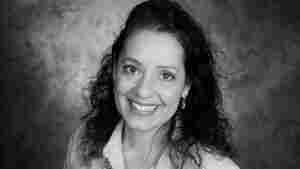 October 20, 2011  The host of the NPR-distributed show has drawn criticism for her role in an offshoot of the Occupy Wall Street protests. Simeone was fired as host of Soundprint, a separate, independently produced documentary radio program. 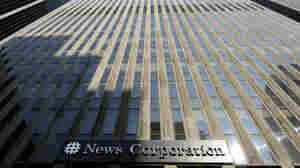 October 18, 2011  The annual meeting of News Corp's shareholders will take place this Friday under unusual circumstances — a growing number of corporate governance advisers and a significant number of investors are calling for the Murdoch family and their close allies to loosen their hold on the corporation's board. This follows the phone hacking and police corruption scandal in the U.K. that has enveloped James Murdoch and his former top lieutenants, as well as subsequent questions about the larger company's governance and structure. As the Murdochs control about 40 percent of voting stock and a sympathetic Saudi prince controls another 7 percent, there is almost no mathematical chance they can be forced to relinquish control on a vote. However, it represents a moment at which notable opposition has built up against the Murdochs — both outside and inside the corporate sphere. 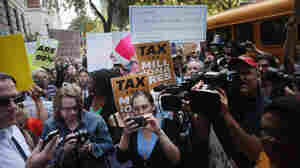 Protesters with Occupy Wall Street march along New York's 5th Avenue, where prominent heads of major business and financial institutions live, on Tuesday. The movement has expanded, along with media coverage. October 13, 2011  At first, the complaint from the left was that news organizations had ignored the movement. But as they swung their gaze, journalists weren't quite sure how to characterize what they saw. Lacking easy labels, Occupy Wall Street proved difficult for the media to categorize — and to cover. October 4, 2011  Children's television executive Gary Knell has new ideas about raising money for the network — and he may well need them. 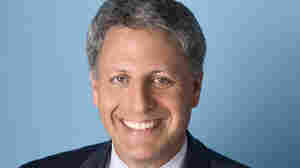 He is taking over NPR at a time when taxpayer support is under fire. October 3, 2011  Gary Knell will take over as CEO and president after a rocky year in which the network lost several top executives and faced renewed funding challenges. He currently leads the company behind Sesame Street and other beloved children's shows. News Corp.'s U.K. Actions Under Scrutiny In U.S.
September 27, 2011  The newest legal front for Rupert Murdoch's media giant involves the Foreign Corrupt Practices Act, a 1977 law banning U.S. firms from paying bribes to government officials abroad. The British division of the U.S. company has admitted that private investigators working for one of its newspapers paid police for information from confidential databases. September 23, 2011  Joe McGinniss stirred controversy with his book The Rogue on Sarah Palin even before it came out. Last summer, he moved in next door to Palin's lakeside home in Wasilla, Alaska, and was denounced as a stalker. His book is crammed with anecdotes of wrongdoing and hypocrisy in her public and private lives — but he's also drawing just as much attention for how he reported his tale. September 16, 2011  MSNBC's newest opinion host is the Rev. 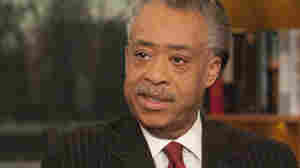 Al Sharpton, a figure much better known for a past in which he cast more heat than light. With his new job, Sharpton is now on his third act in public life: from a civil rights activist to a player in the Democratic Party to, now, a cable talk show host. September 7, 2011  A parliamentary committee in London summoned four former top officials for Rupert Murdoch's British newspaper empire to face questions about the tabloid phone-hacking scandal there. Those former executives contradicted previous testimony from their old boss: James Murdoch. August 16, 2011  A newly revealed letter from a jailed reporter claims hacking was "widely discussed" at editorial meetings of the now closed News of the World. It further implicates the paper's former editor and adviser to the British prime minister — as well as senior executives at News International. August 10, 2011  Rupert Murdoch is expected to take questions from analysts, investors and reporters during a conference call Wednesday. The call follows Tuesday's meeting of the News Corp. board — the first such meeting since the phone hacking scandal that has roiled the company. August 10, 2011  The News Corp. board of directors met in Los Angeles Tuesday. 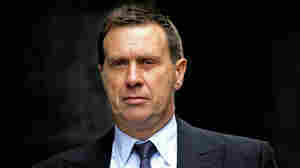 It was the first time members had gotten together since the phone-hacking scandal that has roiled its British holdings. August 5, 2011  Members of the British Parliament are pushing for Piers Morgan to return to the U.K. to face questions about his time as the editor of the Daily Mirror. The pressure has grown since Paul McCartney's ex-wife raised new allegations of hacking involving the media group that owns the Mirror.